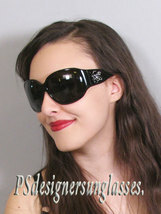 Versace 4149-B GB1/87 Sunglasses Versace sunglasses MOD. 4149-B GB1/87 shiny black plastic frame with smoke lenses and 3D flower with swarovki crystals on the temple, measures approximately 64 x16 x 125. Made in Italy. 100% authentic, brand new and comes with all original packaging materials. Would make an impressive gift for any occasion, or just treat yourself. Combined shipping available for all items in my store. 100% Satisfaction guaranteed. Payment and shipping arrangements must be made within 3 days of sale end date, and all transactions complete within 7 days unless arranged otherwise, or item will be relisted. Click here to visit my purpleshoshana gifts store We accept Paypal Shipping policy: Item shipped within 48hrs of payment receipt. We ship internationally.